Pictured above are MHS BPS students who have qualified for the state leadership conference and competition. On the front row: Alexandrea Salazar, Ana Pruneda. On the second row: Anna Hernandez, Alondra Garza, Aileen Hernandez, Mariana Vargas, Anna Cazares, Rhaudell Cordova. On the third row are: Luis Hilario, Alicia Carmona, Rocio Rendon, Amanda Saenz. Not pictured are: Javier Cervantes, Jessica Galindo, Adry Salazar, Jovanna Hernandez. 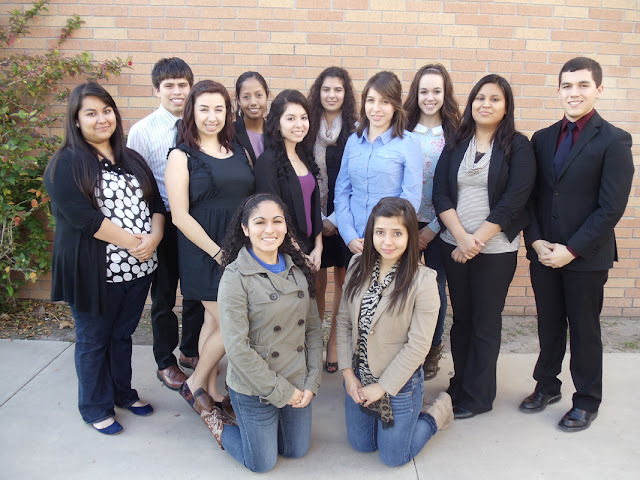 Top students from Mission High School (MHS) will be attending the Business Professionals of America (BPA) 2013 State Leadership Conference in Houston, Texas, in late February. The MHS chapter members will join over 2,500 other conference delegates from across the state to participate in state-level business skill competitions, general sessions, and the state officer candidate campaigns and elections. The state qualifiers are: Rhaudell Cordova, advanced spreadsheets; Mariana Vargas/Anna Hernandez/Alexandrea Salazar, administrative support team; Alicia Carmona, advanced word processing; Rocio Rendon/Aileen Hernandez/Adry Salazar, broadcast news production; Anna Cazares, database applications; Luis Hilario, fundamental spreadsheets; Anna Hernandez, integrated software; Rhaudell Cordova/Alondra Garza/Jessica Galindo/Amanda Saenz, PowerPoint presentation management team; Javier Cervantes, advanced spreadsheets; Rocio Rendon, database aplications; Ana Pruneda, fundamental accounting; Jovanna Hernandez, computer network technology. The MHS BPA chapter also has quite a few students on standby as alternates for the state competitions. They are: Karen Cantu/Claudia Cavazos/Javier Cervantes/Alyssa Flores/Wendy Guiterrez/Itzel Lopez/Jennifer Troncoso, parliamentary procedures team; Alondra Garza, advanced interview skills; Claudia Cavazos, basic office procedures; Diana Del Moral, fundamental accounting; Kimberly Muniz, interview skills; Andy Garcia; payroll accounting; Olga Garza/Jessenia Rodriguez/Irma Torres, administrative support team; Jovanna Hernandez, computer network technology; Lidia Contreras, graphic design promotion; Harley Rodriguez/Celeste Vela, global marketing; Karla Aguilar/Anakaren Guerrero, PowerPoint presentation management team; Harley Rodriguez, prepared speech; Jennifer Troncoso, presentation management individual.